"City Hall", "Town Hall", and "Rathaus" redirect here. For other uses, see City Hall (disambiguation), Town Hall (disambiguation), and Rathaus (disambiguation). Stockholm City Hall, where the Nobel Banquet takes place on 10 December each year. By convention, until the mid 19th-century, a single large open chamber (or 'hall') formed an integral part of the building housing the council. The hall may be used for council meetings and other significant events. This large chamber, the "town hall" (and its later variant "city hall") has become synonymous with the whole building, and with the administrative body housed in it. The terms "council chambers", "municipal building" or variants may be used locally in preference to "town hall" if no such large hall is present within the building. The local government may endeavor to use the town hall building to promote and enhance the quality of life of the community. In many cases, "town halls" serve not only as buildings for government functions, but also have facilities for various civic and cultural activities. These may include art shows, stage performances, exhibits and festivals. Modern town halls or "civic centres" are often designed with a great variety and flexibility of purpose in mind. As symbols of local government, city and town halls have distinctive architecture, and the buildings may have great historical significance – for example the Guildhall, London. City hall buildings may also serve as cultural icons that symbolize their cities. The term "town hall" may be a general one, often applied without regard to whether the building serves or served a town or a city. This is generally the case in the United Kingdom (with examples such as Manchester and Liverpool Town Halls in the cities of Manchester and Liverpool respectively), Australia (with Sydney Town Hall in the city of Sydney), New Zealand, Hong Kong, and many other Commonwealth countries. 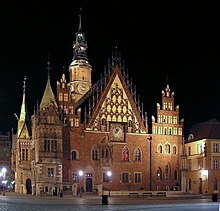 English-speakers in some regions use the term "city hall" to designate the council offices of a municipality of city status. 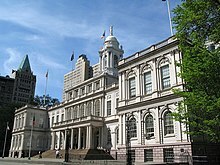 This is the case in North America, where a distinction is made between city halls and town halls; and is also the case with Brisbane City Hall in Australia. town hall: "A large hall used for the transaction of the public business of a town, the holding of a court of justice, assemblies, entertainments, etc. ; the great hall of the town-house or municipal building; now very commonly applied to the whole building"
city hall: "chiefly N. Amer., the chief municipal offices of a city; hence, the municipal officers collectively"
County Council administrations in parts of England and Wales generally operate from a base in a building called, by analogy, a "County Hall" or "Shire Hall". Conversely, cities that have subdivisions with their own councils may have borough halls. In Scotland, local government in larger cities operates from the "City Chambers", otherwise the "Town House". Elsewhere in English-speaking countries, other names are occasionally used. In London, the official headquarters of administration of the City of London retains its Anglo-Saxon name, the Guildhall, signifying a place where taxes were paid. In a small number of English cities (including Birmingham, Coventry and Nottingham) the preferred term is "Council House": this was also the case in Bristol until 2012, when the building was renamed "City Hall". In Birmingham, there is a distinction between the Council House, the seat of local government, and the Town Hall, a concert and meeting venue which pre-dates it. In the City of Sheffield, the distinction is between the Town Hall, the seat of local government, and the City Hall, a concert and ballroom venue. Large halls called basilicas were used in Ancient Rome for the administration of justice, as meeting places, and for trade. In the Early Medieval period, the hall, a single large open chamber, was the main, and sometimes only room of the home of a feudal lord. There the lord lived with his family and retinue, ate, slept and administered rule and justice. Activities in the hall played an essential role in the functioning of the feudal manor, the administrative unit of society. As manorial dwellings developed into manor houses, castles and palaces, the hall, or "great hall" as it was often termed, remained an essential unit within the architectural complex. In the later Middle Ages or early modern period, many European market towns erected communal market halls, comprising a covered open space to function as a sheltered marketplace at street level, and one or more rooms used for public or civic purposes on the upper floor or floors. Such buildings were frequently the precursors of dedicated town halls. The modern concept of the town hall developed with the rise of local or regional government. Cities administered by a group of elected or chosen representatives, rather than by a lord or princely ruler, required a place for their council to meet. The Cologne City Hall of 1135 is a prominent example for self-gained municipal autonomy of medieval cities. The Palazzo Pubblico of the Republic of Siena and the Palazzo Vecchio of the Republic of Florence, both town halls, date from 1297 and 1299 respectively. In each case the large, fortified building comprises a large meeting hall and numerous administrative chambers. Both buildings are topped by very tall towers. Both buildings have ancient timepieces by which the people of the town can regulate their lives. Both buildings have facilities for the storage of documents and references that pertain to the city's administration. These features: a hall, a tower and a clock, as well as administrative chambers and an archive or muniment room became the standard features of town halls across Europe. Brussels Town Hall of the 15th century, with its 96-metre (315 ft) tower, is one of the grandest examples of the medieval era, serving as a model for 19th-century town halls such as the Rathaus, Vienna. During the 19th-century town hall buildings often included "reading rooms" to provide free education to the public, and it eventually became customary for the town or city council to establish and maintain a library as part of its service to the community. The grand chamber or meeting place, the "town hall" itself, became a place for receptions, banquets, balls and public entertainment. Town halls, particularly during the 19th century, were often equipped with large pipe organs to facilitate public recitals. In the 20th-century town halls, as venues, have served the public as places for voting, examinations, vaccinations, relief in times of disaster and the posting lists of war casualties, as well as for the more usual civil functions, festivities and entertainments. Local councils have tended increasingly to remove administrative functions into modern offices. Where new premises are designed and constructed to house local governments, the concepts and functions of administrative council offices and of a civic town hall become separated. 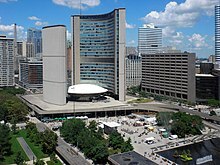 English-speakers (particularly in North America) can use the term "city hall" by metonymy to mean "municipal government" or government in general, as in the axiom "You can't fight city hall". "Town hall" tends to have less formal connotations (cf. Town meeting). ^ Michael M. Grynbaum (May 24, 2012). "The Reporters of City Hall Return to Their Old Perch". The New York Times. Retrieved December 6, 2013. ^ "www.chambersharrap.co.uk". Chambersharrap.co.uk. Retrieved 2012-12-01. Tittler, Robert (1991). Architecture and power: the town hall and the English urban community, c. 1500–1640. Oxford University Press. p. 211. ISBN 978-0-19-820230-1. Retrieved 2010-04-02.